What could be better than a bunch of heroic hot dudes taking their clothes off for shelter pets? Exactly. 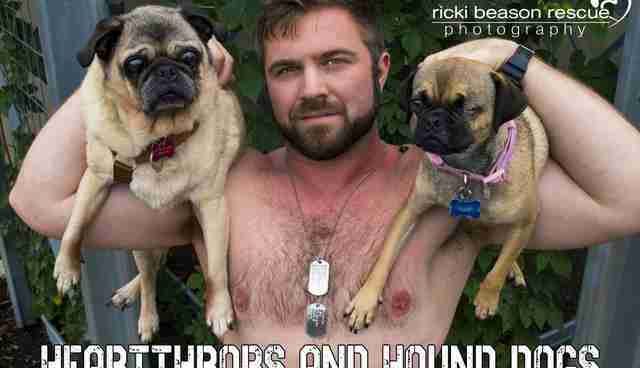 Dallas photographer Ricki Beason got the idea for her "Heartthrobs and Hound Dogs" calendar last year. She already volunteers her time to take photos of shelter dogs - but she wanted to help even more. "My passion for rescue dogs began six years ago when I got my first rescue of my own, Blue," Beason told The Dodo. "I want to help save as many dog's lives that I can with my photography ... Last year I started the Heartthrobs and Hound Dogs Calendar, featuring firemen cuddling adorable dogs, in an effort to reach beyond the borders of Dallas." For this year's calendar, Beason called on local military veterans who share her passion for helping animals. "I couldn't imagine a better combination for a calendar than heartthrob veterans with rescue dogs," she said. "I am featuring shirtless veterans from all branches of the military along with rescue dogs that are available for adoption," Beason told The Dodo. "These veterans are not male models - they are good souls with kind hearts that took time from their schedule to do a unpaid photoshoot to help rescue dogs." "These rescue dogs deserve to be seen for their full potential and not be overlooked just because they didn't come from a breeder," Beason said. "Military veterans deserve to be in the limelight as well and recognized for their service to our great country." The dogs featured in the 2016 calendar are all available for adoption at Dallas-area shelters, and the proceeds from the calendar, which can be purchased here, all go to animal rescues. Beason is happy that her project will spread smiles and, hopefully, help some shelter dogs find homes. "Rescue dogs are beautiful and full of more love than one person could ever hope for," she said. We can't wait to see what she comes up with for next year's calendar.